Super Soaker S.E. 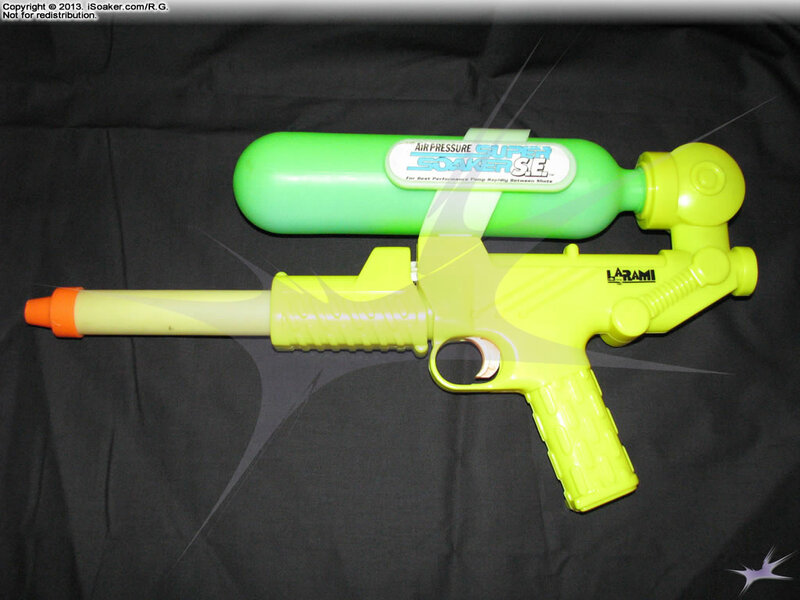 Review, Manufactured by: Larami Ltd., 1992 :: :: iSoaker.com >> iSoaker.com :: Armoury :: Product Analyses/Reviews Listing :: Super Soaker S.E. The Super Soaker S.E. is an interesting water blaster that does not appear in most old Larami Corp. catalogs. It appears to be a differently labeled Super Soaker 40 in a different color scheme, looking more like a smaller version of the original Super Soaker SS 50, but overall has a more rugged construction. The reservoir does not hold that much water, but considering its size, the tank will suffice. This particular sample iSoaker.com has acquired appears to have a good amount of photobleaching of the sticker label and some of the plastic parts. Surprisingly, it does hold pressure and can still create a solid stream of water, but since some of the plastic and seals feel more brittle due to its age. As such, it has not been fully pressurized and full output testing will not be done since it is not likely to be performing as it used to. What "S.E." may stand for is open to guessing at the moment. Was it supposed to be the "Standard Edition", "Special Edition", or just have some added letters along with the name akin to various car models. As with the Super Soaker SS50, one of the main problems with the Super Soaker S.E. is its rather small pump volume it has for pressurizing the tank. The second major problem is the joint where the reservoir attaches to the rest of the blaster. The attachment region is a common area for soakers based on this design to break and/or leak. Otherwise, the blaster is reportedly quite good.